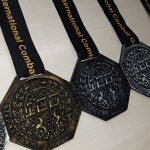 Smith’s Wood Academy students Kallum Ryder (Year 7) and Dylan Matthews (Year 10) won big at the International Combat Organisation tournament which took place in Rome, Italy during half-term. The competition was the culmination of months of training and hard-work with the England squad in preparation for the annual world championship event. Kallum won gold in the ring continuous under 35 category and bronze medals in mat continuous and says he felt ‘really excited’ and ‘proud’. Kallum also talks enthusiastically about how proud his family is of him. It is through a family friend that Kallum began his love of combat. Dylan took home a gold in the 55kg full-contact category, and silver medals in boxing, mats and ring continuous. Dylan says he “felt amazing” when receiving the medals because he “worked really hard for it”. Dylan also had great support from his family saying they were also incredibly proud of him. Dylan got into sport eight years ago when he was being bullied at primary school. This experience led to him training once or twice a week to deal with the issues he was facing. Since then, he has ‘fallen in love’ with the sport and regularly trains twice a day, every day. Staff and students at Smith’s Wood Academy are very proud of Kallum and Matthew as they admirably balance being sporting superstars and role-model students. And they’re not done yet! Not content with international medal success, Kallum aims to win a number of belts and become an undefeated champion, Dylan’s ambition is to fight in the UFC and wants to win a title by the end of the year. We have a feeling they will both achieve these phenomenal and inspiring goals.